Seema Sueko from Mo'Olelo Performing Arts Company recently checked in about the progress of Mo'Olelo's Aha! 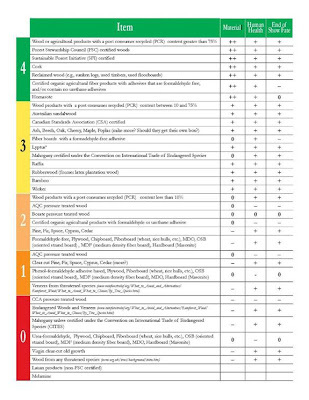 project: the Green Theater Choices Toolkit Scorecard. If it all looks a little technical, don't worry, she enlisted the help of Eric Wilmanns of Brown & Wilmanns Environmental to help out with some handy definitions. We have a proto-type for the Green Theater Choices Toolkit Scorecard! This is an overview of how the material fairs when you consider its total life-cycle impacts. 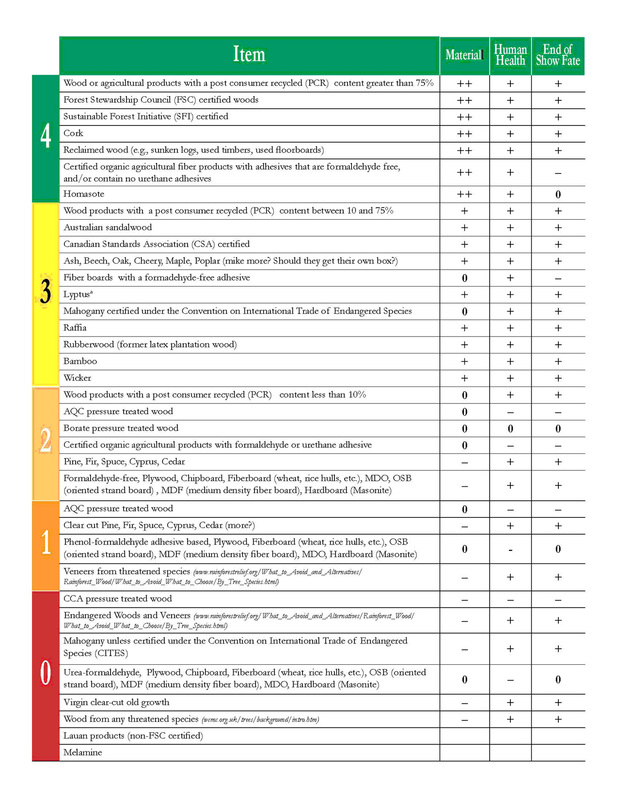 We take into account the conditions and environmental impacts associated with obtaining the basic raw materials, e.g. oil and natural gas, forest management and harvesting, mining, agricultural production etc. We also consider human social issues that effect the production of raw materials, manufacturing, use and end-of-life on affected communities and cultures. We consider the relative amount of energy required for obtaining and manufacturing the product as well as associated green house gas considerations. Note that many of these factors and indicators we rank by qualitative vs. quantitative means. So we might not have absolute numbers for each material in each category – but where we do have numbers we use them. For this focus we look specifically at the human health effects of the manufacture and use of a given material. We consider both acute and chronic health concerns and also if materials or compounds used in the life cycle of the product are carcinogenic or may cause reproductive effects or mimic hormones in the human body (endocrine disruptors). This may sound super science focused and to a large degree we try to do just that. We give more weight to a compound that has issues that can affect the end user but we also look up and downstream in the products life to see if workers are affected there too. We typically call this parameter “end-of-life” but end of show seems more relevant for this project. Here we address the potential for reuse, recycle and reclamation and the potential impacts associated with reuse and/or recycling, land filling and/or incineration. At Woolly, literally everyone can have an impact on the art. So it seemed a no-brainer for us to send each of our full-time staff members out into the wider world to do a working sabbatical to glean new ideas and pick-up best practice insights at operations perhaps outside the regular purview of our theatrical network. Easier said than done! It's proved especially challenging for us to arrange our sabbaticals, as we're attempting to reach out to new companies and organizations where we don't necessarily already have a relationship. But sadly opening these doors has not been as easy as we hoped. While there is enthusiasm for the program's concept, not everyone is willing or able to house one of our staffers. But the Woolly spirit is to keep trying until we figure it out! And now the good news: we've gotten our first placement secured! Development Director Tim Plant is going back to school, and in this case he'll be in some pretty good company at DC's Sidwell Friends School. He'll glean some ideas and best practices for keeping alumni and their families connected to an organization long after the immediate relationship ends. This is particularly compelling for the Washington arts scene as the District frequently has a sizable residential turnover with each majority swing. Can a modestly sized theater -- where so much of the connection of patrons involves them actually experiencing our plays -- keep donor relationships going once they're not attending regularly or even still in the region? An intriguing question, and one we hope we'll soon be able to successfully answer affirmatively. As for the rest of the staff, people are FIRED UP to get out there this summer, particularly as our colossal Season 30 will be soon upon us! Our props master wants to get her hands dirty at an FX house, our operations/company manager wants to see how the talent is managed at the D.C. United football club, and I am hoping to observe corporate philanthropy in action at the Whole Foods Foundation in Austin. Fingers crossed!